Using the bifurcation theory of dynamical systems to a class of nonlinear fourth order analogue of the B(m,n) equation, the existence of solitary wave solutions, periodic cusp wave solutions, compactons solutions, and uncountably infinite many smooth wave solutions are obtained. Under different parametric conditions, various sufficient conditions to guarantee the existence of the above solutions are given. Some exact explicit parametric representations of the above waves are determined. System (1.6) is a 5-parameter planar dynamical system depending on the parameter group . For different m, n and a fixed , we shall investigate the bifurcations of phase portraits of System (1.6) in the phase plane as the parameters are changed. Here we are considering a physical model where only bounded travelling waves are meaningful. So we only pay attention to the bounded solutions of System (1.6). In this section, we study all possible periodic annuluses defined by the vector fields of (1.6) when the parameters are varied. Now, the straight lines is an integral invariant straight line of (2.1). By the theory of planar dynamical systems, we know that for an equilibrium point of a planar integrable system, if then the equilibrium point is a saddle point; if and then it is a center point; if and ,.then it is a node; if and the index of the equilibrium point is then it is a cusp, otherwise, it is a high order equilibrium point. We next use the above statements to consider the bifurcations of the phase portraits of (2.1). 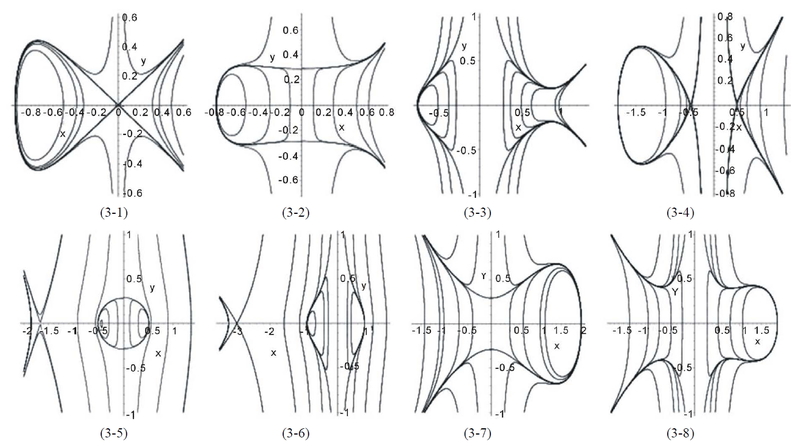 In the parameter plane, the curves partition it into 4 regions for shown in Figure 1 (1-1), (1-2), (1-3), and (1-4), respectively. 1) The case , We use Figure 2, Figure 3, Figure 4, and Figure 5 to show the bifurcations of the phase portraits of (2.1). Figure 6 and Figure 7 show respectively the phase portraits of (2.3) for and . In this section, we give some exact explicit parametric representations of periodic cusp wave solutions. We will show in Section 4 that (3.10) gives rise to two periodic cusp wave solutions of peak type and valley type of (1.3). Figure 1. (1-1) m – n = 2l, n = 2n1; (1-2) m – n = 2l − 1, n = 2n1; (1-3) m – n = 2l, n = 2n1 + 1; (1-4) m – n = 2l-1, n = 2n1 + 1. Figure 2. the phase portraits of (1.6) for m – n = 2l, n = 2n1,l, n1∈Z+. (2-1) r < 0, n1 = 2, (p, q) ∈ (A3); (2-2) r < 0, n1 ≥ 2, (p, q) ∈ (A3); (2-3) r > 0, n1 ≥ 2, (p, q) ∈ (A3); (2-4) r > 0, n1 = 1, (p, q) ∈ (A3); (2-5) r < 0, n1 = 2, (p, q) ∈ (A4); (2-6) r < 0, n1 ≥ 3, (p, q) ∈ (A3). Figure 3. the phase portraits of (1.6) for m – n = 2l – 1, n = 2n1, l, n1∈Z+. (3-1) r < 0, n1 = 1, (p, q) ∈ (B1); (3-2) r < 0, n1 = 2, (p, q) ∈ (B1∪B2); (3-3) r > 0, n1 ≥ 2, (p, q) ∈ (B1) ∪(B2); (3-4) r > 0, n1 ≥ 2, (p, q) ∈ (B3); (3-5) r < 0, n1 = 2, (p, q) ∈ (B3); (3-6) r < 0, n1 ≥ 2, (p, q) ∈ (B1∪B2); (3-7) r < 0, n1 = 2, (p, q) ∈ (B4) ∪(B2); (3-8) r > 0, n1 ≥ 2, (p, q) ∈ (B4). We will show in Section 4 that (3.10) gives rise to a solitary wave solutions of peak type and valley type of (1.3). We will show in Section 4 that (3.6) gives rise to a smooth compacton solution of (1.3). Figure 4. (4-1) r > 0, n1 = 1, (p, q) ∈ (C1); (4-2) r > 0, n1 ≥ 1, (p, q) ∈ (C2); (4-3) r > 0, n1 = 1, (p, q) ∈ (C2); (4-4) r > 0, n1 ≥ 2, (p, q) ∈ (C2); (4-5) r < 0, n1 = 1, (p, q) ∈ (C2); (4-6) r < 0, n1 ≥ 2, (p, q) ∈ (C2); (4-7) r > 0, n1 ≥ 2, (p, q) ∈ (C3); (4-8) r < 0, n1 = 1, (p, q) ∈ (C3); (4-9) r > 0, n1 = 1, (p, q) ∈ (C4); (4-10) r < 0, n1 = 1, (p, q) ∈ (C4); (4-11) r > 0, n1 ≥ 2, (p, q) ∈ (C4); (4-12) r < 0, n1 ≥ 2, (p, q) ∈ (C4). Figure 5. the phase portraits of (1.6) for m – n = 2l – 1, n =2n1 + 1, l, n1∈Z+ (5-1) r > 0, n1 ≥ 2, (p, q) ∈ (D2); (5-2) r > 0, n1 = 1, (p, q) ∈ (D2); (5-3) r > 0, n1 ≥ 2, (p, q) ∈ (D3) ∪(D4); (5-4) r > 0, n1 = 1, (p, q) ∈ (D3) ∪(D4); (5-5) r < 0, n1 ≥ 2, (p, q) ∈(D3) ∪(D4); (5-6) r < 0, n1 = 1, (p, q) ∈(D3) ∪(D4); (5-7) r < 0, n1 ≥ 2, (p, q) ∈ (D2); (5-8) r < 0, n1 = 1, (p, q) ∈ (D2). Figure 6. The phase portraits of (1.6) for n = 2n1, n1∈Z+. (6-1) r < 0, n1 = 2, m1 ≥ n1, p < 0; (6-2) r < 0, n1 ≥ 2, m1 > n1, p < 0; (6-3) r > 0, m1 > n1, p < 0. Figure 7. The phase portraits of (1.6) for n = 2n1 + 1, n1 ∈ Z+. (7-1) r > 0, n1 = 1, m1 ≥ n1, p > 0; (7-2) r < 0, n1 = 1, m1 > n1, p < 0; (7-3) r < 0, n1 ≥ 2, m1 > n1, p > 0, (7-4) r < 0, n1 ≥ 2, m1 > n1, p < 0. We will show in Section 4 that (3.8) gives rise to a solitary wave solution of peak type or valley type of (1.3). We will show in Section 4 that (3.10) gives rise to a smooth compacton solution of (1.3). where We will show in Section 4 that (3.14) gives rise to a smooth compacton solution of (1.3). We will show in Section 4 that (3.16) gives rise to two periodic cusp wave solutions of peak type and valley type of (1.3). In this section, we use the results of section 2 to discuss the existence of smooth and non-smooth solitary wave and periodic wave solutions. We first consider the existence of smooth solitary wave solution and periodic wave solutions. 1). Suppose that : Then, corresponding to a branch of the curves defined by (1.7), equation (1.3) has a smooth solitary wave solution of peak type, corresponding to a branch of the curves defined by (1.7), equation (1.3) has a smooth family of periodic wave solutions (see Figure 4 (4-4)). 2). 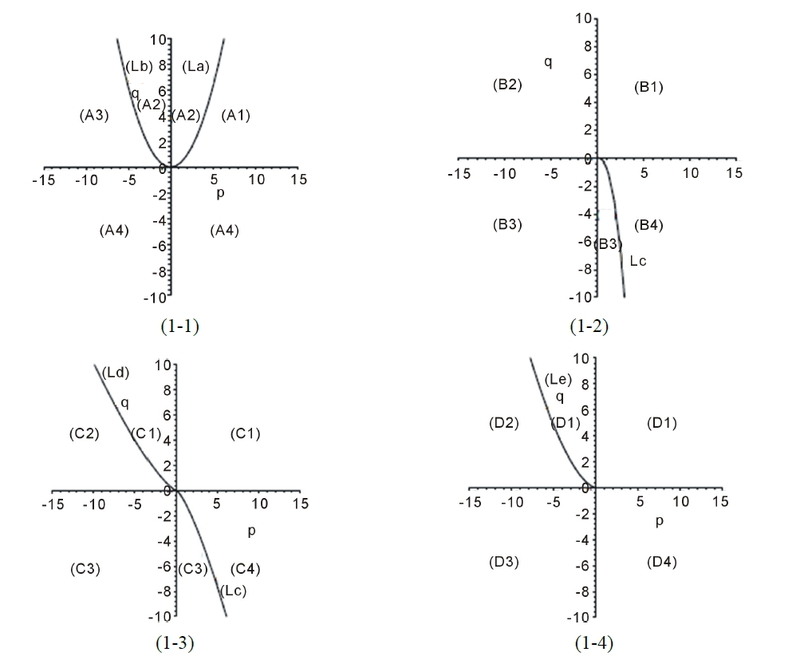 Suppose that : Then, corresponding to a branch of the curves defined by (1.7), equation (1.3) has a smooth solitary wave solution of peak type, corresponding to a branch of the curves defined by (1.7), equation (1.3) has a smooth family of periodic wave solutions (see Figure 4 (4-3)). 3). Suppose that , Then, corresponding to a branch of the curves defined by (1.7), equation (1.3) has a smooth solitary wave solution of peak type, corresponding to a branch of the curves defined by (1.7), equation (1.3) has a smooth family of periodic wave solutions (see Figure 4 (4-12)). 4). Suppose that , Then, corresponding to a branch of the curves defined by (1.7), equation (1.3) has a smooth solitary wave solution of valley type, corresponding to a branch of the curves defined by (1.7), equation (1.3) has a smooth family of periodic wave solutions (see Figure 4 (4-3)). 5). Suppose that , Then, corresponding to a branch of the curves defined by (1.7), equation (1.3) has a smooth solitary wave solution of peak type, corresponding to a branch of the curves defined by (1.7), equation (1.3) has a smooth family of periodic wave solutions (see Figure 2 (2-3)). 6). Suppose that , Then, corresponding to a branch of the curves defined by (1.7), equation (1.3) has a smooth solitary wave solution of peak type, corresponding to a branch of the curves defined by (1.7), equation (1.3) has a smooth family of periodic wave solutions (see Figure 2 (2-3)). 7). Suppose that , Then, corresponding to a branch of the curves defined by (1.7), equation (1.3) has a smooth solitary wave solution of valley type, corresponding to a branch of the curves defined by (1.7), equation (1.3) has a smooth family of periodic wave solutions (see Figure 2 (2-3)). 9). 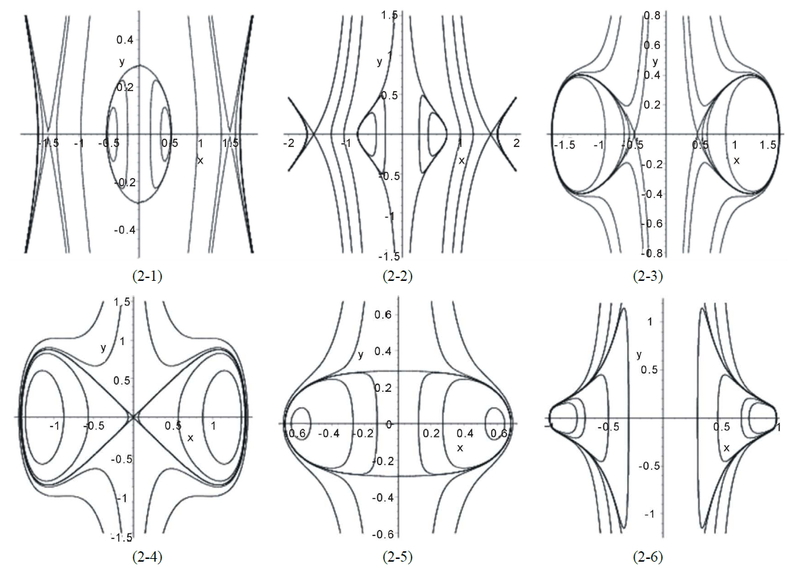 Suppose that: , Then, corresponding to a branch of the curves defined by (1.7), equation (1.3) has a smooth solitary wave solution of valley type, corresponding to a branch of the curves defined by (1.7), equation (1.3) has a smooth family of periodic wave solutions (see Figure 3 (3-4)). 10). Suppose that , Then, corresponding to a branch of the curves defined by (1.7), equation (1.3) has a smooth solitary wave solution of valley type, corresponding to a branch of the curves defined by (1.7), equation (1.3) has a smooth family of periodic wave solutions (see Figure 2 (2-4)). 11). Suppose that : Then, corresponding to a branch of the curves defined by (1.7), equation (1.3) has a smooth solitary wave solution of valley type, corresponding to a branch of the curves defined by (1.7), equation (1.3) has a smooth family of periodic wave solutions (see Figure 3 (3-1)). We shall describe what types of non-smooth solitary wave and periodic wave solutions can appear for our system (1.6) which correspond to some orbits of (2.1) near the straight line . To discuss the existence of cusp waves, we need to use the following lemmarelating to the singular straight line. Lemma 4.2 The boundary curves of a periodic annulus are the limit curves of closed orbits inside the annulus; If these boundary curves contain a segment of the singular straight line of (1.4), then along this segment and near this segment, in very short time interval jumps rapidly. Base on Lemma 4.2, Figure 2, and Figure 3, we have the following result. a). For corresponding to the arch curve defined by (1.7), equation (1.3) has two periodic cusp wave solutions; corresponding to two branches of the curves defined by (1.7), equation (1.3) has two families of periodic wave solutions. When h varies from to 0, these periodic travelling waves will gradually lose their smoothness, and evolve from smooth periodic travelling waves to periodic cusp travelling waves, finally approach a periodic cusp wave of valley type and a periodic cusp wave of peak type defined by of (1.7) (see Figure 2 (2-5)). defined by (1.7), equation (1.3) has two families of periodic wave solutions. When h varies from to 0, these periodic travelling waves will gradually lose their smoothness, and evolve from smooth periodic travelling waves to periodic cusp travelling waves, finally approach a periodic cusp wave of valley type and a periodic cusp wave of peak type defined by of (1.7) (see Figure 2 (2-1)). c). For corresponding to the arch curve defined by (1.7), equation (1.3) has two periodic cusp wave solutions; corresponding to two branches of the curves defined by (1.7), equation (1.3) has two families of periodic wave solutions. When h varies from 0 to , these periodic travelling waves will gradually lose their smoothness, and evolve from smooth periodic travelling waves to periodic cusp travelling waves, finally approach a periodic cusp wave of valley type and a periodic cusp wave of peak type defined by of (1.7) (see Figure 3 (3-7)). d). For corresponding to the arch curve defined by (1.7), equation (1.3) has two periodic cusp wave solutions; corresponding to two branches of the curves defined by (1.7), equation (1.3) has two families of periodic wave solutions. When h varies from 0 to , these periodic travelling waves will gradually lose their smoothness, and evolve from smooth periodic travelling waves to periodic cusp travelling waves, finally approach a periodic cusp wave of valley type and a periodic cusp wave of peak type defined by of (1.7) (see Figure 3 (3-5)). d). For corresponding to the arch curve defined by (1.7), equation (1.3) has two periodic cusp wave solutions; corresponding to two branches of the curves defined by (1.7), equation (1.3) has two families of periodic wave solutions. When h varies from 0 to , these periodic travelling waves will gradually lose their smoothness, and evolve from smooth periodic travelling waves to periodic cusp travelling waves, finally approach a periodic cusp wave of valley type and a periodic cusp wave of peak type defined by of (1.7) (see Figure 3 (3-3)). We can easily see that there exist two families of closed orbits of (1.3) in Figure 2 (2-6), Figure 3 (3-6) and in Figure 6 (6-2). 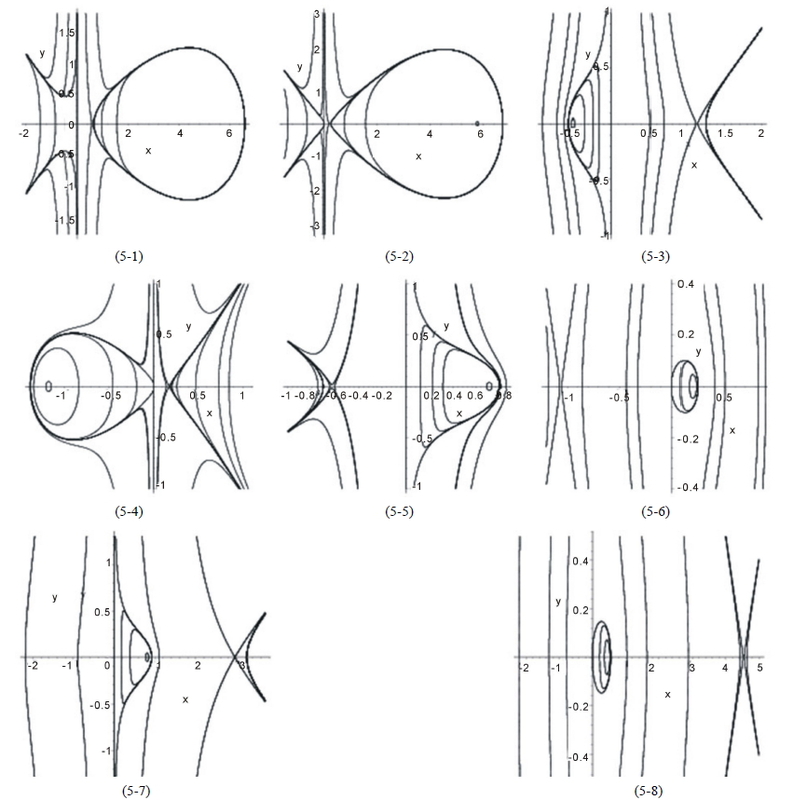 There is one family of closed orbits in Figure 3 (3-3), (3-8), Figure 4 (4-2), (4-5) - (4-7), (4-9), (4-11) and in Figure 5 (5-3), (5-5) - (5-7) and in Figure 7 (7-3), (7-4). In all the above cases there exists at least one family of closed orbits (1.3) for which as whichh from to 0, where is the abscissa of the center, the closed orbit will expand outwards to approach the straight line and will approach to . As a result, we have the following conclusions. a). If ; then when in (1.7), Equation (1.3) has a family of uncountably infinite many periodic traveling wave solutions; where varies from to 0, these periodic traveling wave solutions will gradually lose their smoothness, and evolve from smooth periodic traveling waves to periodic cusp traveling waves (see Figure 4 (4-2)). b). If ; then when in (1.7), Equation (1.3) has a family of uncountably infinite many periodic traveling wave solutions; when varies from 0 to , these periodic traveling wave solutions will gradually lose their smoothness, and evolve from smooth periodic traveling waves to periodic cusp traveling waves (see Figure 4 (4-7)). c). If ; then when in (1.7), Equation (1.3) has a family of uncountably infinite many periodic traveling wave solutions; when varies from 0 to , these periodic traveling wave solutions will gradually lose their smoothness, and evolve from smooth periodic traveling waves to periodic cusp traveling waves (see Figure 4 (4-6)). d). If ; then when in (1.7), Equation (1.3) has a family of uncountably infinite many periodic traveling wave solutions; when varies from to 0, these periodic traveling wave solutions will gradually lose their smoothness, and evolve from smooth periodic traveling waves to periodic cusp traveling waves (see Figure 4 (4-11)). e). If ; then when in (1.7), Equation (1.3) has a family of uncountably infinite many periodic traveling wave solutions; when varies from 0 to , these periodic traveling wave solutions will gradually lose their smoothness, and evolve from smooth periodic traveling waves to periodic cusp traveling waves (see Figure 4 (4-5)). f). If ; then when in (1.7), Equation (1.3) has a family of uncountably infinite many periodic traveling wave solutions; when varies from 0 to , these periodic traveling wave solutions will gradually lose their smoothness, and evolve from smooth periodic traveling waves to periodic cusp traveling waves (see Figure 4 (4-9)). 2). Suppose that ,then when in (1.7), Equation (1.3) has two family of uncountably infinite many periodic traveling wave solutions; when varies from 0 to , these periodic traveling wave solutions will gradually lose their smoothness, and evolve from smooth periodic traveling waves to periodic cusp traveling waves (see Figure 2 (2-6)).Parallelling to Figure 2 (2-6), we can see the periodic travelling wave solutions implied in Figure 3 (3-6) and Figure 6 (6-2) have the same characters. g). If ; then when in (1.7), Equation (1.3) has a family of uncountably infinite many periodic traveling wave solutions; when varies from 0 to , these periodic traveling wave solutions will gradually lose their smoothness, and evolve from smooth periodic traveling waves to periodic cusp traveling waves (see Figure 5 (5-6)). h). If ; then when in (1.7), Equation (1.3) has a family of uncountably infinite many periodic traveling wave solutions; when varies from 0 to , these periodic traveling wave solutions will gradually lose their smoothness, and evolve from smooth periodic traveling waves to periodic cusp traveling waves (see Figure 5 (5-7)). i). If , then when in (1.7), Equation (1.3) has a family of uncountably infinite many periodic traveling wave solutions; when varies from to 0, these periodic traveling wave solutions will gradually lose their smoothness, and evolve from smooth periodic traveling waves to periodic cusp traveling waves (see Figure 5 (5-3)). j). If , then when in (1.7), Equation (1.3) has a family of uncountably infinite many periodic traveling wave solutions; when varies from 0 to , these periodic traveling wave solutions will gradually lose their smoothness, and evolve from smooth periodic traveling waves to periodic cusp traveling waves (see Figure 5 (5-5)). k). If , then when in (1.7), Equation (1.3) has a family of uncountably infinite many periodic traveling wave solutions; when varies from to 0, these periodic traveling wave solutions will gradually lose their smoothness, and evolve from smooth periodic traveling waves to periodic cusp traveling waves (see Figure 5 (5-5)). Equation (1.3) has one family of uncountably infinite many periodic traveling wave solutions; when varies from 0 to , these periodic travelling wave solutions will gradually lose their smoothness, and evolve from smooth periodic travelling waves to periodic cusp travelling waves (see Figure 7 (7-4)). This work is supported by t NNSF of China (11061010, 11161013). The authors are grateful for this financial support. Bibikov, Y.N. (1979) Local Theory of Nonlinear Analytic Ordinary Differential Equations. Lecture Notes in Mathematics, Vol. 702. Springer-Verlag, New York.